I have received an e-mail from a reader who is concerned about her neighbour’s plan to put a screen fence about 35 cm from the base of her beautiful frangipani tree, because the fence posts must be set in concrete and doesn’t know the size of the tree’s root ball or if it will damage the tree. As new concrete near gardens is a common problem for gardeners, I am posting my answer on my blog rather than merely giving a private reply. Generally, the feeder roots of shrubs and trees are located under the outer edge of the plant’s foliage in what is called the drip-line. Nature designed plants this way so that rain (and bird droppings, mineral dust etc.) 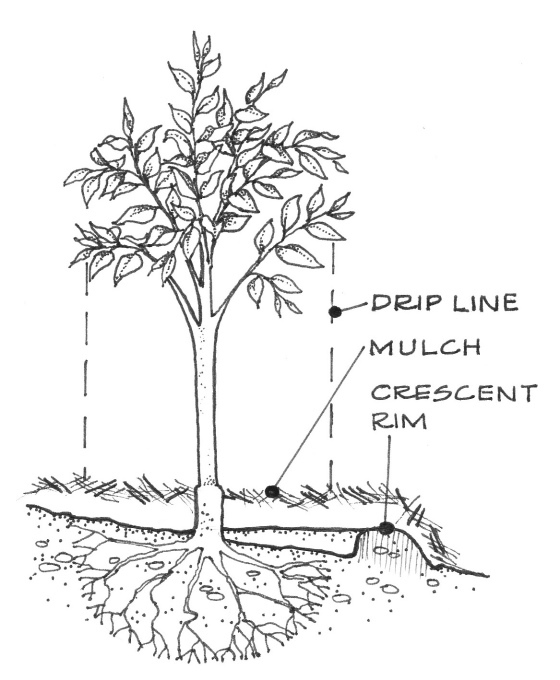 running off the foliage falls where water and nutrients can be taken up quickly by the feeder roots (see diagram). There are some exceptions to this rule as roots of umbrella trees, figs, crepe myrtles and liquidambers, for example, can wander all over the place in search of water. 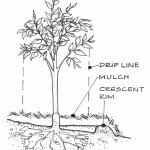 Usually, when trees or shrubs are severely pruned back, they will produce new feeder roots below the new drip-line and this can be helpful in preparing to move large shrubs and small trees. New concrete contains lime that makes it alkaline, and hydrated lime (brickie’s lime) that is used in concrete will burn plant roots and should not be used on gardens that contain plants. If you are unable to avoid using concrete for walls or footings near established trees or shrubs, you can ask the builder to line the hole with strong plastic sheeting to prevent the new concrete coming into contact with plant roots. Plastic degrades in light but not in soil. Adding plenty of mature compost to topsoil before planting trees and shrubs will help protect plants from the adverse effects of new concrete as one of the functions of compost is to buffer plant roots from unsuitable pH levels in surrounding soil. Where plants are established before concrete is used, adding a 5 cm layer of mature compost to the drip-line area, and covering it with 5 cm of organic mulch will help your plants. Remember to keep compost and mulch well clear of the trunk. A more serious concern is where the concrete is to support a wall or fence close to established plants and the trees and shrubs need to be pruned on the side closest to the wall, as timing is important. Some plants, including frangipani, bleed a lot of sap if pruned when they are not dormant. The very best time for this type of pruning to reduce “bleeding” sap, is to prune during Last Quarter phase of the moon. For these plants, the wall or fence should be constructed during winter when the affected trees and shrubs are completely dormant. However, if a shrub or small tree requires a lot of sunlight or warmth for good growth, and the proposed structure will prevent this (i.e. the plant will be on the south side of the structure), it may be best to move the plant during winter for deciduous plants, or in autumn for evergreens, to a more suitable spot or into a large tub, if space is limited. In the case of frangipanis, these lovely trees are often seen growing against north-facing walls of houses. Once concrete has seasoned, it does not seem to bother them, and they love the warmth that is stored in the wall during the day and slowly released at night. This entry was posted in Around the farm..., Fruits and Vegetables, Ornamentals and tagged Aussie gardening, Australian gardening, beckyard gardening, climate change gardening, cuttings, easy gardening, easy organic gardening, environmentally friendly gardening, fertiliser, flowers, fruit trees, garden soil, growing plants, Healthy soil, how to grow, moving plants, new concrete, New Zealand gardening, organic gardening, plants, pruning, sustainable gardening, when to plant, when to prune. Bookmark the permalink. My green house base builder spread a lot of raw cement powder under the slabs, which also got mixed in with rest of soil. My concern is more than the alkalinity; I am worried about the content of aluminium in cement, which is harmful to health. I am planning to use the green house for vegetables and fruit shrubs. What is your opinion on this? Would be grateful for your advice. The important thing to remember Mano is that soil pH determines which elements are absorbed by plants. Between a pH of 6.0 and 9.0 very little aluminium is absorbed by plants. See: What’s soil pH?